We work in partnership with countries in the Indo-Pacific region to improve access to better quality jobs so women and girls can gain more from participating in the economy. Australia's Gender Equality and Women's Empowerment strategy applies across all work undertaken by the Department of Foreign Affairs and Trade. 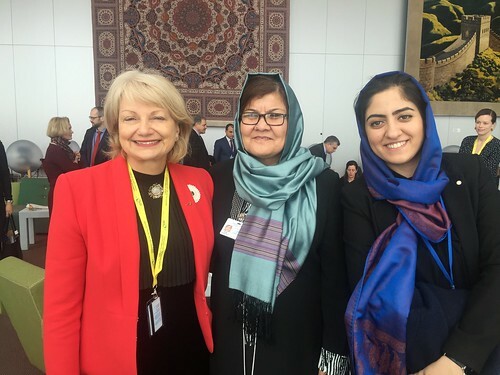 Australia's Ambassador for Women and Girls, The Honorable Dr Sharman Stone, works to ensure that gender equality and empowerment of women and girls is a central focus of Australia's diplomatic, development and regional security efforts. The Ambassador for Women and Girls advocates internationally for women's equal participation in political, economic and social affairs. The Ambassador advances global development, peace and stability by promoting gender equality and women's leadership and decision-making at all levels. A message from Dr Sharman Stone, on her third International Women’s Day as Ambassador for Women and Girls, as she celebrates the opportunities for collaborating to support gender equality. A message from Australia’s Ambassador for Women and Girls, The Honorable Dr Sharman Stone, to mark International Women’s Day 2017. The honourable Dr Sharman Stone became Australia's third Ambassador for Women and Girls on February 15, 2017.
enhance the participation of women in decision-making and leadership. The Office of the Ambassador for Women and Girls was established by former Prime Minister Julia Gillard, former Foreign Minister Kevin Rudd and former Minister for the Status of Women Kate Ellis in September 2011. Ms Penny Williams was Australia's first Ambassador for Women and Girls. The creation of the Ambassador position reflects the Australian Government's active commitment to promote gender equality and to give women a stronger voice, particularly in the Asia-Pacific region.